In the Philippines, there is an alarming rate of one in every 11 adults who has goiter or other thyroid problems. This is common in females especially thyroid disorders such as hypothyroidism and hyperthyroidism. Based on research, females who just gave birth and those in the menopausal stage are also at risk. 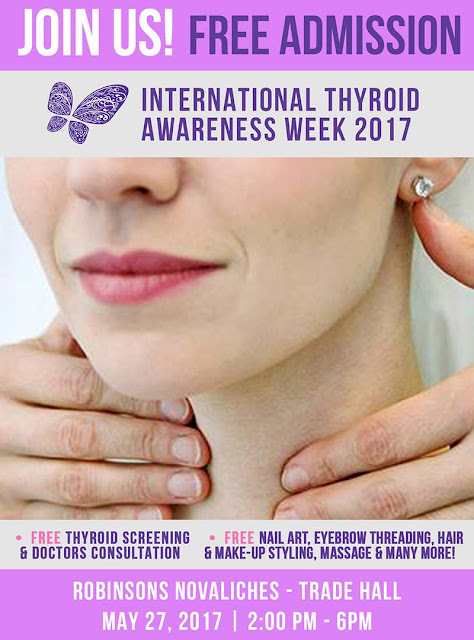 It is also noted that thyroid disorders are often undetected because most people suffering from it doesn't really feel bothered since the symptoms are: tiredness, anxiety, weight fluctuations, and difficulty in sleeping. These are usually attributed to lifestyle and being stressed at work. Thyroids role is to control metabolism and if left undetected and untreated, it can result to health problems such as lose of weight or gaining too much weight even if the person doesn't eat much, heart palpitations, and other symptoms. Early diagnosis can prevent these symptoms and will restore the body's normal metabolism. On May 27, Merck and a team of endocrinologist will have a free consultation and thyroid screening at the Trade Hall of Robinsons Novaliches from 2 - 6pm.